Start your day with these delicious and healthy pear bran muffins filled with pears, spices, and topped with orange zest. Stir together turbinado sugar and orange zest in a small bowl. Preheat oven to 350°F. Line a 12-cup muffin pan with 10 paper liners (leaving 2 muffin cups empty). Whisk together wheat bran, flour, sugar, baking powder, baking soda, cinnamon, ginger, and salt in a large bowl. Whisk together buttermilk, applesauce, oil, and egg in a medium bowl. Add wet ingredients to dry ingredients and stir until just combined and dry ingredients are moistened. Stir in pear pieces. Divide batter among the 10 lined muffin cups. Sprinkle orange-sugar topping on top of each muffin. Bake for 22 to 25 minutes or until a toothpick or cake tester inserted in the center comes out clean. Cool muffins in the pan for 5 minutes. Transfer muffins to a wire rack and cool completely. 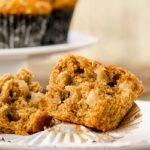 Start your day in a delicious and healthy way with these Pear Bran Muffins. They are filled with pears, spices, and topped with orange zest.